Okay, Peeps, I figured it out. I bought an image in order to participate in the From The Heart monthly challenge. It's a deal where once you get started, if you play every month, you get the monthly stamp image. I decided that I really like the images and I want to participate. The problem was I figured I would "remember" where the stamp came from and I didn't write it down. Every do something silly like that? Depend on that "great" memory to be there when you needed it? Needless to say, mine failed me. But we are back on track now. Isn't this just the sweetest little image and how much more Fall could this be? I used Teresa Collins Spring Fling dp and DCWV cs. The sentiment is from A Muse, cut out with a Sizzix die and I used nesties for the image, colored with Copics. I added several KaiserCraft rhinestones for a little bling. Thanks for stopping by and thanks for your patience! Your coloring and the DP looks so pretty and the sentiment is just great ! Awww...what a sweet image and great coloring too. 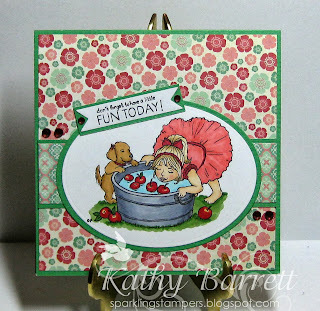 Thanks for playing along in the Anything Goes Challenge with us over at the Simon Says Stamp Wed Challenge Blog! Tks for joining the last Challenge at the House of Gilli ! Hope to see you again in our next challenge that will be launched soon !